Fires are burning on the Big Island of Hawaii as a surge of lava pulses down slope through as many as six tubes, threatening the last remaining home in a neighborhood scorched by lava flows. 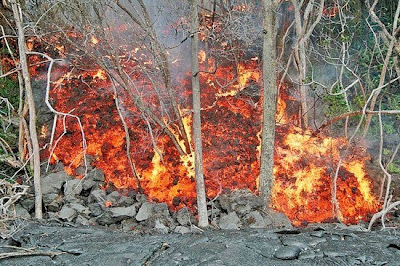 Lava from Kílauea volcano once again has oozed through the mostly abandoned Royal Gardens subdivision, covering portions of the small open areas untouched by previous flows. A high surf warning is in effect for north and west facing shores of Niihau, Kauai, Oahu and Molokai as well as north facing shores of Maui and west facing shores of the island of Hawaii. The warning is posted through 6:00 PM Thursday. Marijuana could be sold legally and have its own tax under a proposal approved Tuesday by a state Senate committee. Two state House committees on Tuesday killed a bill to allow customers to smoke in certain bars. A bill that could lead to casinos on Hawaiian Home Lands passed out of the state House Judiciary Committee, while a separate measure that would allow a single casino on O'ahu also advanced yesterday. Prospects for a statewide ban on fireworks dimmed yesterday after a state Senate committee chose to give counties the ability to opt out. Natural disasters were considered "low-probability events" four years ago when planning began here on a hazard preparedness training program, observed University of Hawaii professor Karl Kim. Spending and visitor arrivals for the Honolulu Marathon have remained at a good pace, with participants spending more than $100 million for the fifth year in a row, despite the tourism industry languishing in a cool-down period. Residents hoping to visit the incredible natural wonders around the Captain Cook Monument in Kealakekua Bay will soon need to apply for a free permit from the state to land their kayaks. Statistics about infant health and mortality can be a weathervane when it comes to predicting future trends in the health of the general population, a state health official says. Honolulu real estate developer and broker Chris Lau has been appointed commissioner to sell the Makena Beach and Golf Resort, which was foreclosed last year. The auction probably will be scheduled for April. A trio of bills that could go a long way toward curtailing unintended land uses and promoting agriculture on the Garden Isle have piled up on the Kaua‘i County Council’s to-do list.